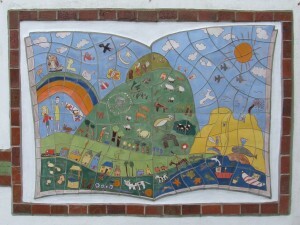 During the school year 2006/2007, pupils in third and fourth class in Ransboro NS completed the erection of a school mural based on the theme of their local environment. Located at the infants’ entrance door, work on creating the mural began with workshops facilitated by ceramic artist and local resident Karen Webster. During these workshops the pupils were enabled to experience most of the strands of the visual arts curriculum as well as certain strands of the SESE and SPHE curricula. Entitled “We Care For Our Environment”, the mural features the design and artwork of the pupils. Colourful illustrations of what the children regarded as being significant in their local environment are represented in the mural – Carrowmore Tombs, the beach, birds, fish, animals, the whale which beached on Culleenamore strand at the time and, of course, Queen Maeve’s grave which the children at the rear of the school can see directly from their classroom each day. Based on these key messages, the pupils made promises to help care for their local environment. They recorded and illustrated these promises. As a follow-up to this mural project, the children compiled and wrote a two volume book detailing the process involved in planning, designing and mounting the new school mural. The book contains the stories that are told in the mural. It also contains samples of the pupils’ original artwork upon which the mural was based, as well as photos taken at each step of the mural process. Jointly funded by Sligo County Council and the Ransboro Parents’ Association, the mural certainly adds a splash of colour to the front of the school and significantly compliments the rich natural environment in which the school is situated. The children are rightly proud of the mural. The project was started on October 4th, 2006. The number of children involved in making the mural was 27. The size of the mural is 130cm high and 185cm long. The area of the whole mural is 2.405 m squared. The number of tiles in the border of the mural is 54. The number of tiles used on the mural is 147. The date the mural was mounted was May 3rd, 2007. The date of the official unveiling of the mural was June 5th, 2007. When the new extension to the school was built in 2014/2015, we wanted to ensure that this precious mural was preserved. 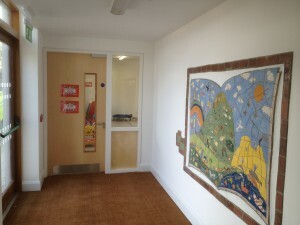 With that in mind, the design team for the extension ensured that the mural became a focal point in the entrance lobby to the new school extension. Now, when people enter the building through the extension entrance, the first thing they see in front of them is our Local Area Mural which is now almost ten years old.